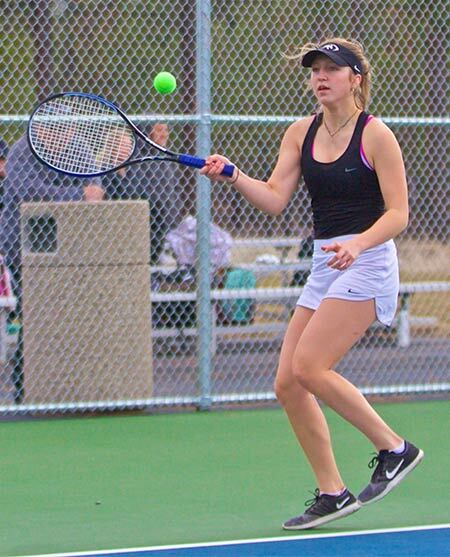 The recent snowy weather hasn’t seemed to affect the girls tennis team at all. They continued their winning streak and improved their record to 3-0 on Wednesday, April 3, with a 6-2 at home over North Marion. It was the first time the Lady Outlaws have been able to play on their home court. Sisters got wins in three singles matches, as well as three wins in doubles play. Rheanna Salisbury (No. 1 singles) defeated M. Cha in two straight sets. Strong play with consistent ground strokes, as well as solid serves, earned her a 6-2 first-set win, followed by a perfect 6-0 second-set win. Ramsey Schar (No. 2 singles) also had a strong performance, and beat C. Jones 6-1, 6-2. Ramsey served well and also had strong ground strokes which helped her earn the win. Holly Wertz (No. 4 singles) defeated S. Mariscal 6-0, 6-3. Holly played steady throughout the match and had good ball placement on the court. The Outlaws also got wins from their No. 1, No. 2, and No. 3 doubles teams. Lola Green and Hallie Schwartz (No. 1) lost their first set to K. June and E. Cha with a score of 5-7, but fought back hard and took the next two sets, 6-3, 6-3, for the win. Alexa Asson and Mattie Mynatt (No. 2) beat O. Bedolla and L. Garibay 6-3, 6-2. The duo took control early, were relaxed in their play, and communicated well. Molly Winter and Ellie Rush played their first match as a doubles team (No. 3). The duo struggled a bit with positioning at the start of the match, but quickly found their groove, capitalized on their opponents weaknesses and posted a 7-5, 6-2 win. The Outlaws will have a full week of tennis ahead. They were scheduled to play at Philomath on Monday, April 8, and Tuesday at Molalla. They will play at Cascade on Wednesday, April 10, at home against Henley on Friday, and attend the Madras Invitational on Saturday.